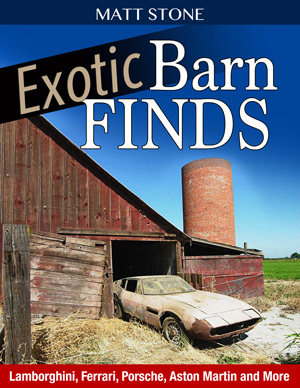 Just Released – EXOTIC BARNFINDS. Every car fanatic fantasizes about finding a Bugatti in a Barn, a Ferrari in a field or a Lambo in a Lean To. My new book covers more than 30 great barnfinds cars and their often amazing stories. Alfas, Maseratis, Lambos, Ferraris, Porsches, Aston Martins, and everyone else’s favorite exotic marques are here with often incredible photos of where the cars were found and what they looked like the day they were extracted from storage. Not just another book full of “nice old cars” found in barns, but the hottest hardware only, and a few celebrity finds too. Available from Amazon.com and CarTech Books.